As you may remember from this post--in order for me to finish my friends den, on my list of things to do, was to build a beam styled mantel to mimic the “wood” beams that are on the ceiling of he den/family room. We had contemplated painting them or removing them, but opted instead to try to make them work in the room. With great inspiration from The Lettered Cottage’s fireplace re-do and pic from DIYnetwork.com( see photos respectively, below) We decided to go with a beam style mantel. Since the previous mantel was made out of cement brick and because I hadn’t planned on doing any masonry demo (nor do I know how to, lol) I built a mantle slipcover. Her mantel was 6’10” long, huge right? Next you should ( I say should, because I did this after I built the box, but It probably would have been better to do this prior to building it) beat up the wood some, let the kids wear off some energy(with supervision of course :) or take your frustrations out on it with a hammer, a razor or some scissors as I did. I then began to build my box. I placed one pine board on the floor and lined the other on its side in front of it, liquid nailed it, made sure it was flush, and nailed it together. Spacing and hammering the nails about every 12 inches along the board. I then liquid nailed the sides(short pieces) and nailed them in place as well. After the boards are nailed, be sure to wipe up any liquid nails with a damp cloth, because it is a pain to get off later. Next, flip the half of box over and do the same as the first step, this will be your bottom of the box/slipcover. This last piece of wood should fit nicely in between your two side pieces. Now you will have a box, minus one side . . . slip this directly over the existing mantel and secure it in an inconspicuous place ( like the top) with masonry/cement screws). I then began to stain the “beam”. I used two different stains because I’m indecisive and was getting anxiety trying choose one in Home Depot to get the color I wanted. The stains I used were Minwax Polyshades Bombay Mahogany first, then Minwax Ebony (this comes out just as it’s named-- ebony, vey dark!) Although I was going for dark, I wanted to still see the wood grain to mimic the ceiling beams. As you can see in these pics, the left side of the mantel is darker than the right. This is what it looks like before it is wiped and smoothed, so you can control the depth of color. Note: Although the end result came out great, if I were to do this again, I would miter the corners so that the wood fit together more seamlessly). So what do you think? I was thinking of going over the actual fireplace with a creamier antique-y type of paint just to lessen the brightness and contrast of the fireplace, but overall I like it! Please share your feedback, I thrive off of it! Love it! We are moving into a place with a bad fireplace and I was excited to see a great option here! Wow Carli! You have done an amazing job. Seriously the mantle is awesome! A+++!!! I love that the stain matches the beams on the ceiling! I can't wait to see more of the room! I bet your friend loves her new space. Thanks Lisa! the best part about it is that it's removable if she gets tired of it! Good luck in your new place! Brandi, I love it too! I was so proud of myself when I was done, because I was having some doubts! More pics will soon follow, just have to do some more finishing touches! Thanks for following the progess! What a difference!!! You did a great job. Ok. You have to link this one too! Stinking Amazing! 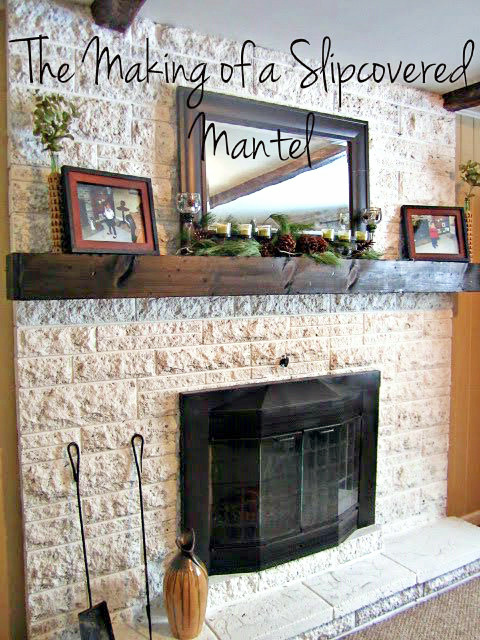 You have seriously helped me solve my mantel issue! THANK YOU! FANTASTIC!! It looks like it's been there forever. And two stains isn't indecisive.....it's just "layering the color for a richer finish." Which, by the way, seems to blend in perfectly with the beams. Well done girl! You simply must go over to my friend Gail's blog and link this up to her Catch as Catch Can party! She did a gorgeous makeover of her fireplace last winter and I know she'll appreciate this one! Now this is an amazing mantle. It looks so modern and warm at the same time. You put some great effort into this. I am on board as a follower to see more. You did an awesome job and I know you're lovin' the transformation! Thanks for linking up to our How To's Day linky party! I love it! It's such an improvement, modern and fresh. You may want to slightly add a wash or lightly sponge some paint on and mush is around just to give it some depth. 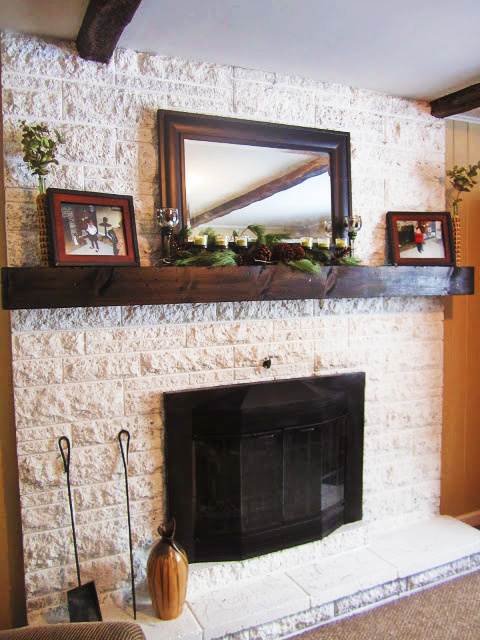 I have a brick mantel and have wanted to do this for some time so I am thrilled to have so ideas on what to do. Did you attach it to the brick mantel or did you put boards on the wall to attach to? Great job!!! Beautifully done! So much better! Wow that's gorgeous. How did you connect it to the exististing mantel? Is it load bearing enough to support a flat screen television? This is exactly what I need to do for a very grungy stone mantle....this will make it pop. Thanks for sharing. So glad to offer some ideas! Love it! Exactly what I will be doing but my fireplace is the length of the entire wall :/ So hoping it turns out as nice! That's awesome! I hope it turns out well ! Looks great! I also need to make a mantel like this for my fireplace. 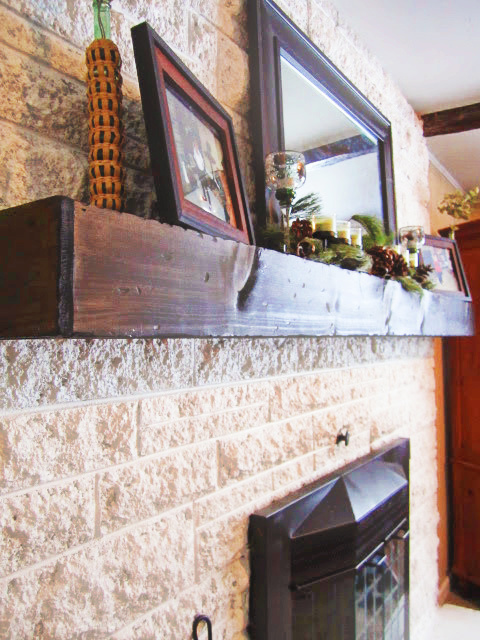 How did you attach the mantel to the brick? Wow Carli! this is an amazing project! It came out so pretty! You did an awesome job!!! You've encouraged me to DIY it. Here's my problem, I want to change the red brick on the fireplace, but I don't want to paint it nor do I want to permanently reface it. I may want to revert back to the natural brick some day. I need something that can be easily removed. I will surely make the mantel cover to go over my marble mantel, but stuck on a temporary cover of the bricks. What do you suggest? Thanks! There are definitely ways to build a frame that “floats” on top/in front of it, in which you can remove once you are “over it”. That would definitely be the route I would go since I like to change things up so often.